Dormant over the winter, my boys' love of bugs instantly revived as soon as the ground thawed. Over the last six weeks, they have been outside turning over every rock and digging holes in any square inch of dirt they can find. Last year, I shared some of our favorite bug books. And then, because we were reading so many, I shared even more favorites. With all those, I really didn't think I would have any reason to write about bug picture books this year. 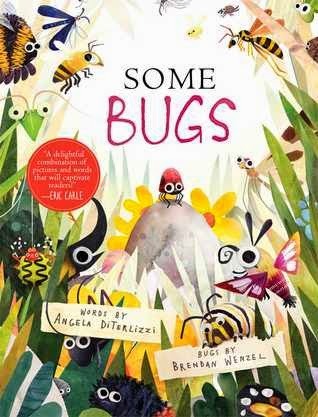 But then I read Some Bugs by Angela DiTerlizzi and illustrated by Brendan Wenzel, and that was all the reason I needed. This book is fabulous. If it had been around last year, it definitely would have made the list. The text reminds me of Emma Dodd's I Love Bugs (another favorite of ours, which I wrote about a long, long time ago). It mentions characteristics or actions of different bugs through a simple rhyme (Some bugs sting. / Some bugs bite. / Some bugs stink. / Some bugs fight.) While Emma Dodd uses flowery phrases in her book, Angela DiTerlizzi usually keeps the descriptions to just one word, which I love. The illustrations depict the bugs that demonstrate those types of actions. For example, the mosquito is a bug that bites. The cricket is a bug that sings. My boys' personal favorite picture is the one with the Hercules beetles--a bug that fights. The illustrations are playful and cute while still being completely recognizable. One of my favorite features of this book is the glossary at the back, which shows every bug from the earlier pages (over forty in all) accompanied by their names. It is so nice to be able to answer my boys' questions of "What's the name of that bug?" with a quick glance at the back and an authoritative answer, "Why, that's the Halloween Pennant Dragonfly" (who knew?!). You'd be surprised how much time we've spent poring over that glossary. I suppose the bugs could have just been labeled when they appeared throughout the book, but it is so fun to have them all collected in one spot and be able to compare their sizes and colors and numbers of legs and other important things like that. Also, my kids think it is so funny that Oskar the cat, who is featured throughout the book, gets a spot in the glossary and that under his name, it say,s "Oskar is not a bug." The two-spotted ladybug shows up on every page, and my kids love finding her (even though she's not difficult to spot). She's usually doing silly things like hiding under a leaf or being carried off by a group of ants. It's one of those books where the illustrations just keep on giving: the more you look, the more you find. I don't think I'll ever be able to say I'm a fan of bugs, but with a book like this one, I guess it's obvious I am a fan of bug picture books.